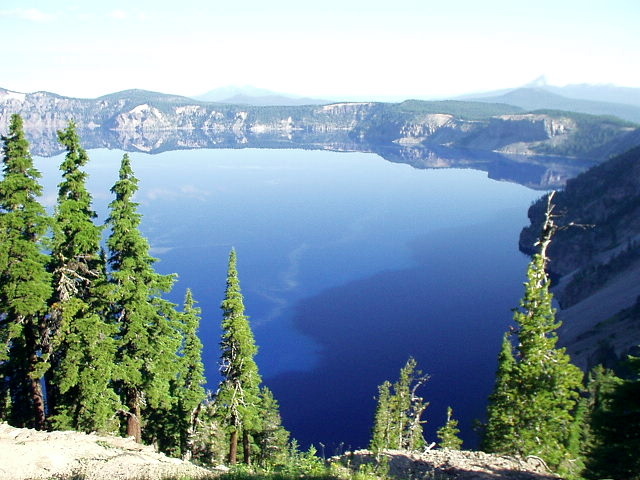 On my way up to Bend, I decided to camp overnight at Crater Lake in Oregon. 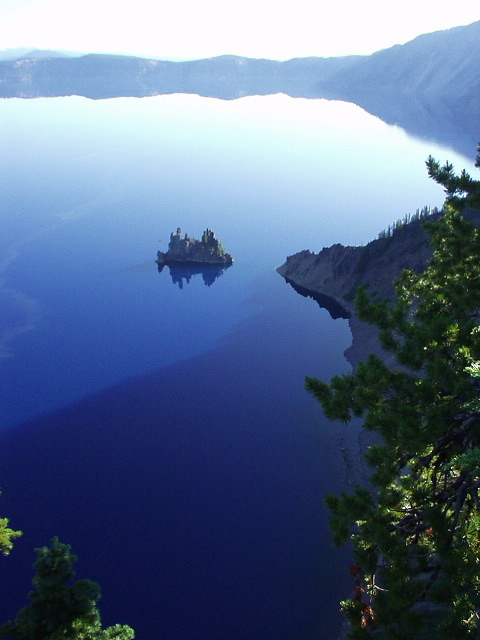 Formerly a volcano that collapsed after an eruption 7000 years ago, Crater Lake is the only national park in this state. 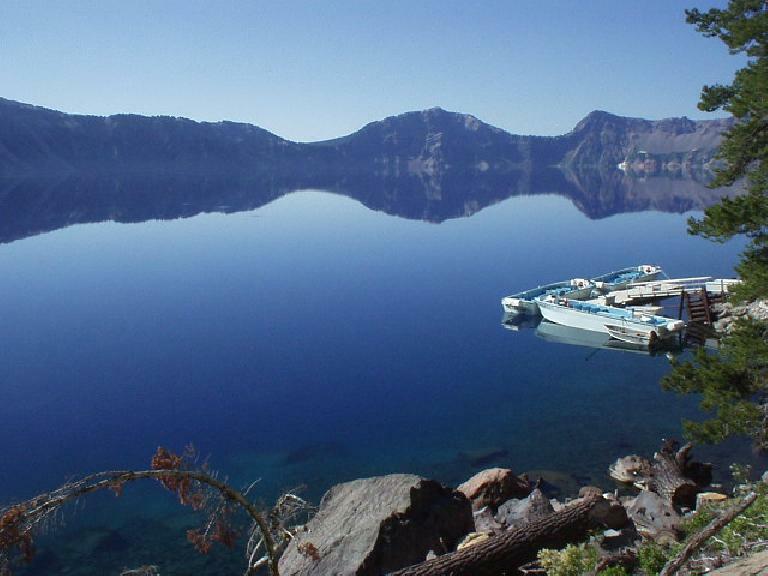 It also happens to be the deepest lake in the nation—1943 feet at its maximum depth—and 7th deepest in the world. The water, some of the most pristine in the world, is a blue hue a tad deeper than that of the sky, and so placid that the enclosing rock walls are mirrored with perfect symmetry. When I arrived at the park it was about 6:00 p.m. on a Friday night, and there were just 5 campsites left at Mawama Village. These were RV campsites too, so the Alfa Romeo got to pretend she was an RV tonight. : ) The campsites were relativley pricey ($18 for a tent site; $20 for an RV site) but pretty posh. In addition to having a table and bear locker at each of the 313 campsites, there were BBQ grills at each one, and bathrooms with mirror, running water, and flush toilets were a short walk away. Showers ($0.75 for 4 minutes) and laundry facilities were available at Mawama Village, where a restaurant should be opening up in 2006. I had a couple of hours to spare before it got dark, so I went for a little bike ride. 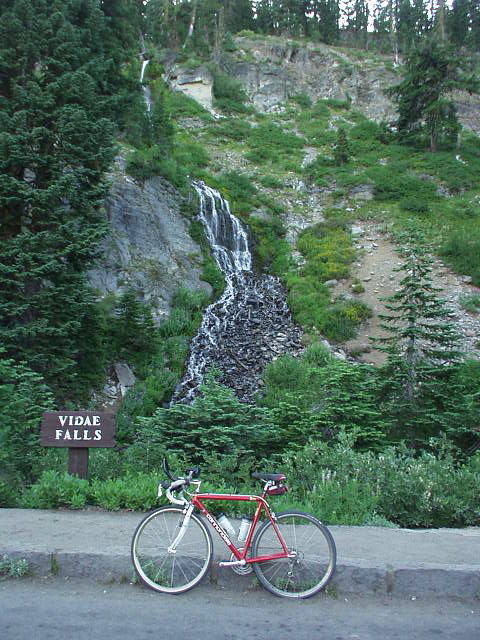 The roads around the crater have lots of low-to-moderate grade climbing, and were well-maintained. They did, however, were bordered by really steep dropoffs. These were certainly not the roads to be even the slightest bit drunk or careless on as one miscue meant certain death into the precipices below. 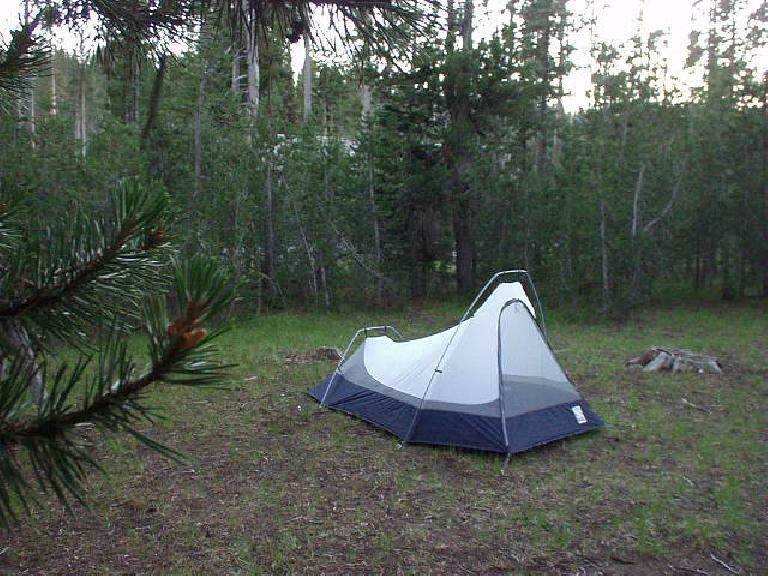 After that was dinner… for the mosquitos. On my “to buy list” now are citronella candles–in the meantime, in the late evening, I think I will either have dinner in the car, or in the sanctity of my tent. Nevertheless, I got great sleep (8 hours), and woke up at about 6:10 a.m. to pack up camp and then get to the showers before a whole horde of campers would do so just a little bit later. There are many good viewpoints. 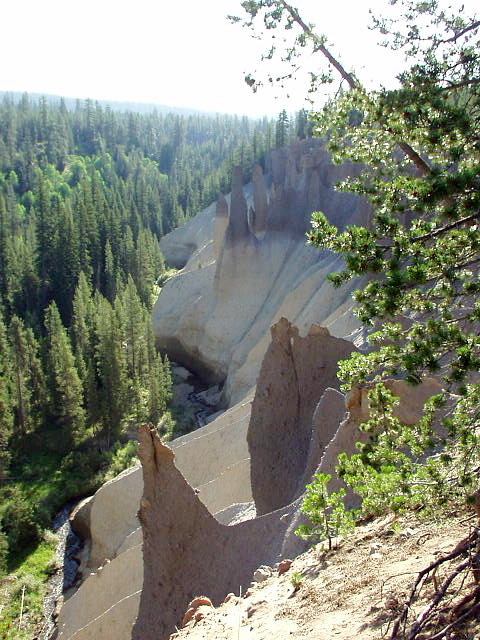 At Sun Notch (a 1/2-mile hike round trip) one can see the Phantom Ship, which is protrusion shaped like a ship and resulted from 2 layers of lava from separate eruptions. 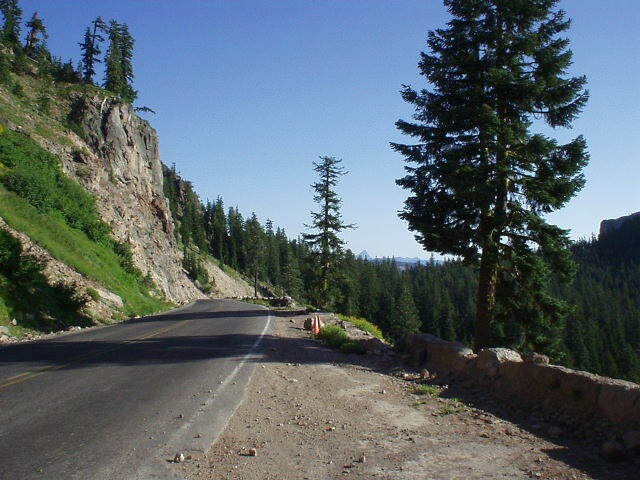 Further down the road is a side road that lead to The Pinnacles. This side road is a gradual descent all the way down, and I was able to coast all the way in neutral (in the car) to get down there. In addition to the many overlooks off of Rim Road there is a trailhead that leads down to a boat dock where boat rides are given. I was there a bit too early for a boat ride but I did hike all the way down to the boats (>700 feet below and ~2 miles of hiking round trip). All in all, this was a worthwhile side trip.